The rumor mill proves true once again. Octagon officials have confirmed a trio of bouts that were previously rumored for “UFC 153: Aldo vs. Koch” will in fact come to fruition. 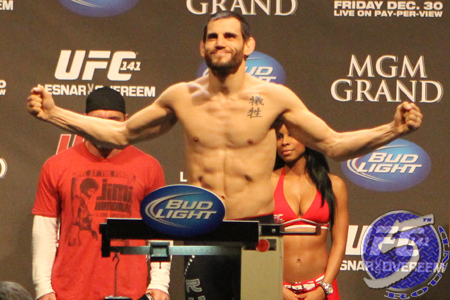 A critical welterweight affair between Jon Fitch (Pictured) and Erick Silva, a 170-pound matchup with Demian Maia and Rick Story, as well as a featherweight contest featuring Joey Gambino and Diego Brandao have all been added to the October 13th fiesta. Of the three fights, only Fitch vs. Silva is a lock to make it on to the pay-per-view portion of the festivities. That fight will likely receive third-to-top billing in the show’s lineup. UFC 153 takes place inside HSBC Arena in Rio de Janeiro, Brazil.